I like the simple designation of meteorological seasons by month, over the astrological solstice and equinox markers. My brain senses the longest day should mark the middle of summer and the shortest day, the middle of winter. By meteorological reference, summer happens in June, July, and August. It sure felt like summer on the second day of June this year. Last night, as we tried to cool the house by opening windows to the evening air, the enticing sounds of heavy, distant rumbling thunder rolled slowly closer and closer. Eventually, we enjoyed an almost gentle thunderstorm that this morning has left barely a trace of its visit. Except for the amazing response of growing things. Our landscape is under siege. Just beyond our deck, the previous prominent low spruce is getting swallowed by ferns from behind and volunteer cedar trees from the front. 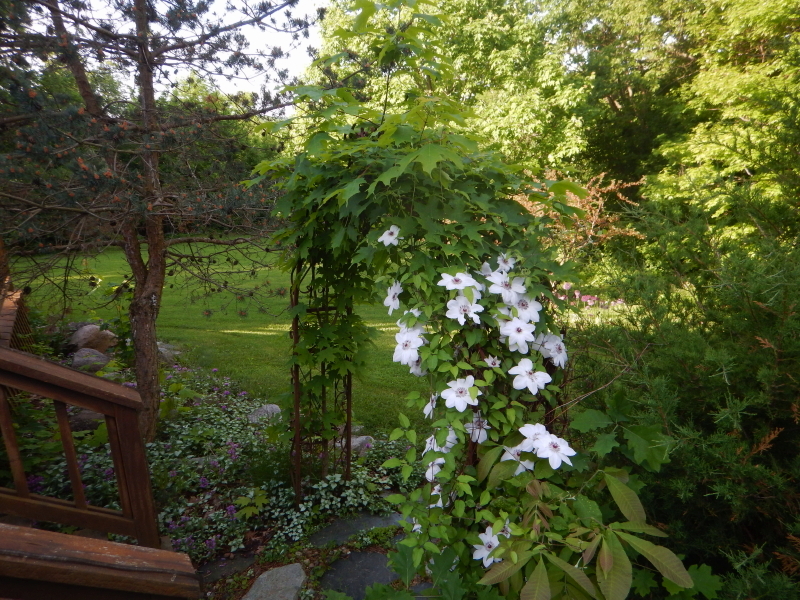 The clematis on our trellis is being crowded out by a volunteer maple that decided to make itself at home there. 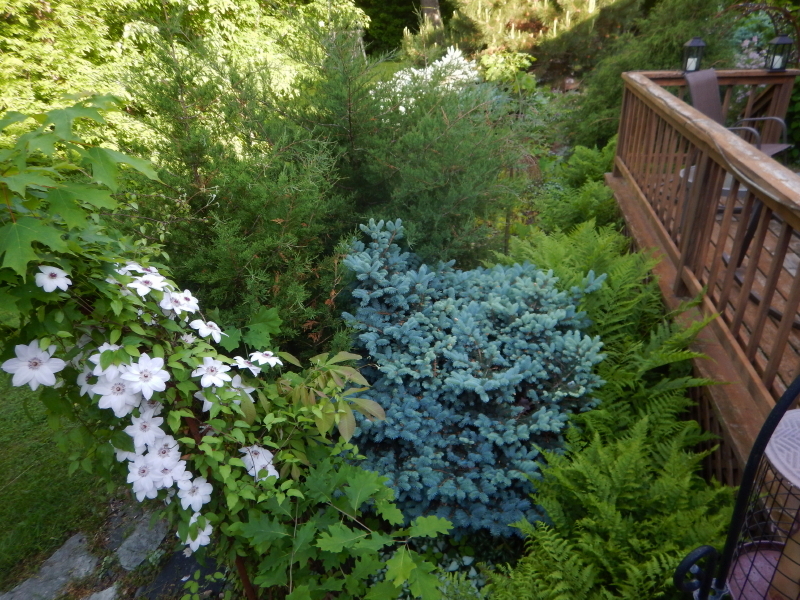 I don’t understand why the scotch pine to the left of the trellis is so anemic. Everything around it is growing fast and furious. It is possibly being hindered by the same affliction taking down so many of our long needle pines. 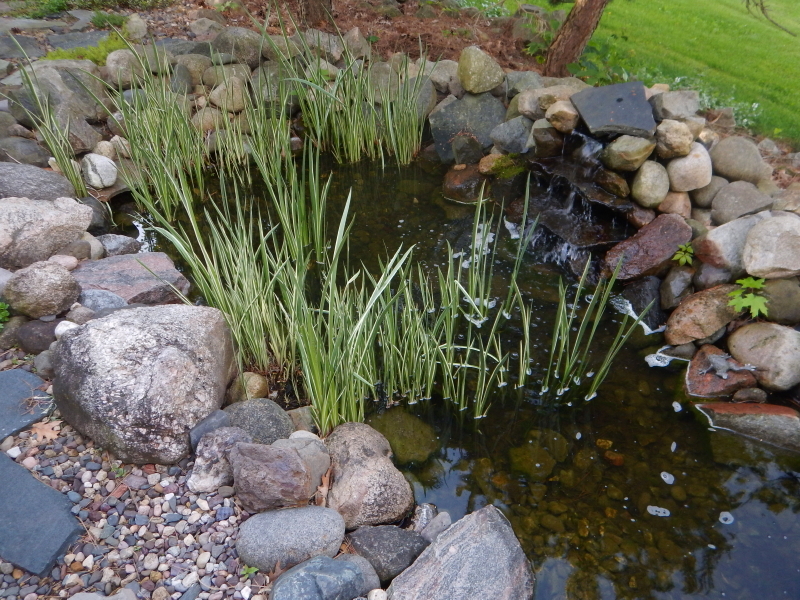 The ornamental reeds in our little garden pond are spreading themselves well beyond the edges, giving the impression they will soon fill the space if left unhampered. Meanwhile, the climbing vines are voraciously trying to blanket all of our trees, the unwanted grasses taking over our pastures, and poison ivy is thriving like you wouldn’t believe. What’s a gardener to do? 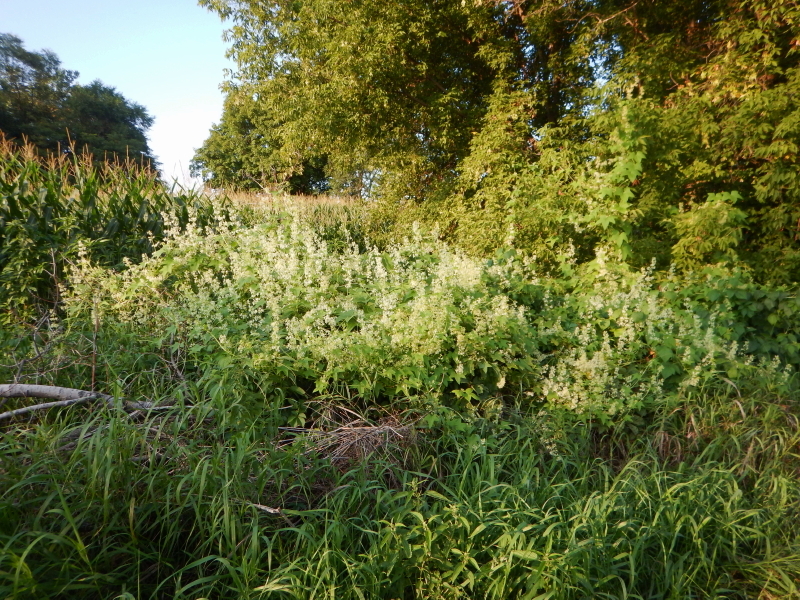 I tend to prefer a hands-off approach to the nature-scape, but we are finding the land inundated with invasives and trouble-makers that require decisive action. 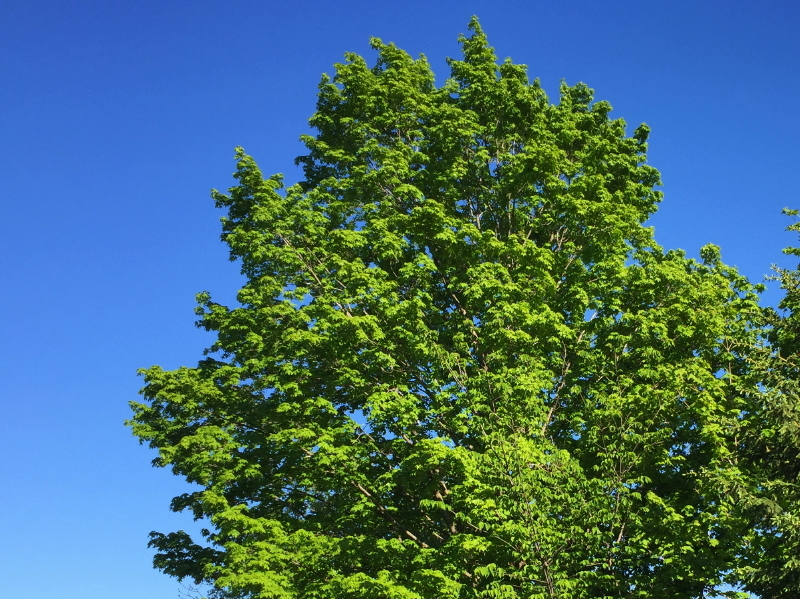 Desirables like maple trees are sprouting in places where they don’t belong, and though prized, will become problems if neglected. 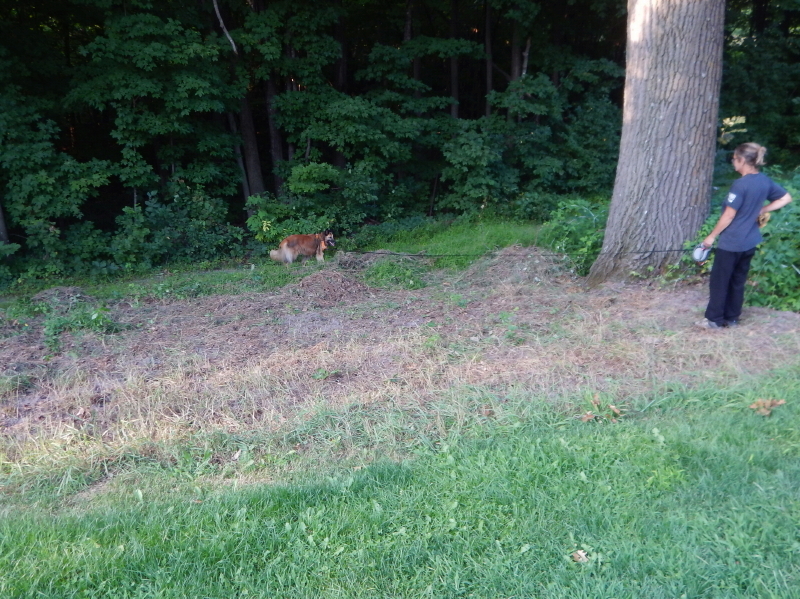 I must overcome my reluctance and sharpen my skills of seek and destroy, or at least aggressively prune, prune, prune. 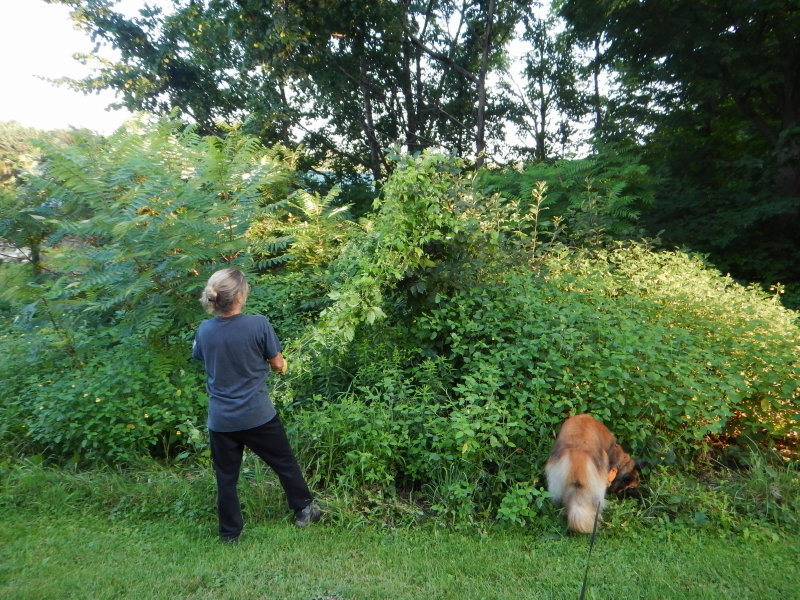 In the same way we wish broccoli tasted like chocolate, Cyndie and I are wishing the desired plants would simply crowd out weeds to the point all we needed to do would be a little cutting of the grass and lounging in the garden. All you folks wanting to suggest we get some goats… it is increasingly weighing on my mind. Maybe I will try renting some for a trial run. There just aren’t enough hours in a day for us to manage the explosion of growth summer brings. 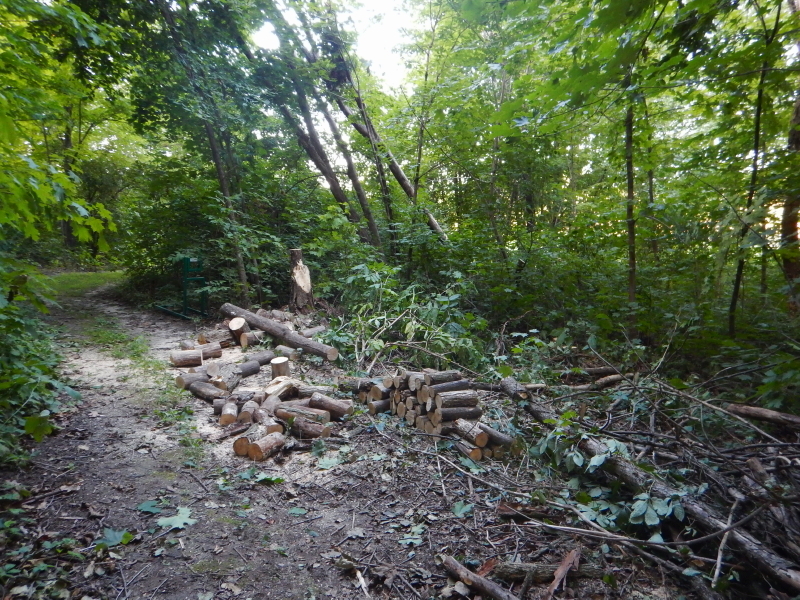 On Monday after work, I ripped into the task of cutting up the dead trees a storm had pushed over, and which I had recently shoved the rest of the way to the ground with the tractor. I quickly figured out what was holding up all the wind-blown trees. Regular readers may recall that I mentioned a while back that vines seemed to be thriving this year. Well, there are vines everywhere in the area of these dead trees. It’s unclear to me whether the vines are responsible for the demise of the trees, or not. I think most of this bunch are butternut trees, which are commonly killed by a fungal butternut canker disease, Sirococcus clavigignenti-juglandacearum. Go ahead, read that out loud. The vines might look like they took over the trees, but they may simply have climbed up trees that were already giving up the ghost. 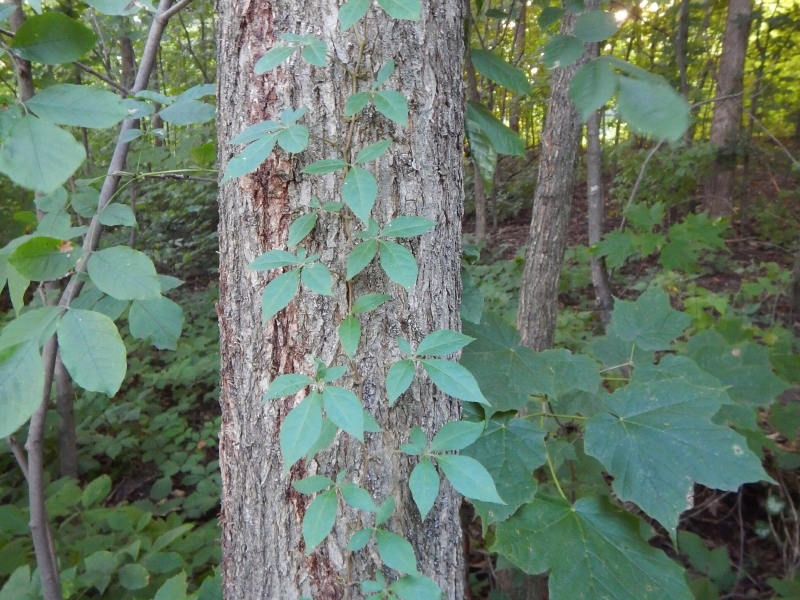 People should be careful when they see Virginia Creeper, because there may be Poison Ivy around also. The two plants almost always grow together. I’ve well documented there is no shortage of poison ivy growing on our acres. The tendrils of the stalks grab and hold the bark of the trees with incredible tenacity. It is comical how the dead trees will gladly slough off the bark, but the vines maintain a grip that results in long dangling empty tree skins hanging down from the canopy. 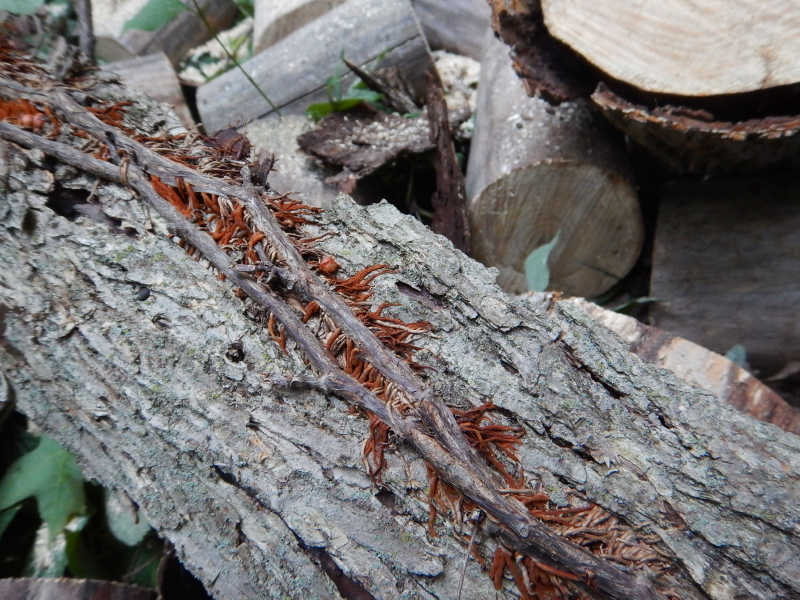 While cutting up the assortment of trees that made it to the ground, I came upon two vine-covered dead snags still standing just behind the spot vacated by the others. They were about half the diameter of those in the ground, so I made quick work of felling them and expanding the evening’s cutting task. So much was accomplished, yet so much remains. The 3 trees still hung up, visible in the background of the picture above, are going to be a lot more difficult to get on the ground. I’m thinking ropes and a come-along may be involved in my next attempt. These trees are not in reach of the tractor. Better yet, maybe the next storm that hits will be blowing in the other direction, and will push them down for me. I heard on the radio yesterday that the local vintners suffered significant losses to their grape-vine crops because of the two nights of below freezing temperatures last weekend. 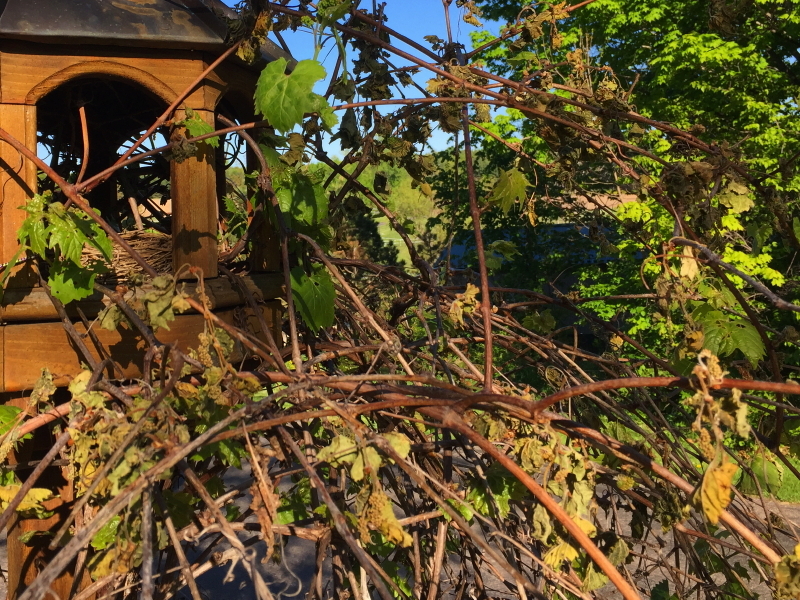 Of all the plants on our property, the wild grape vines look the worst. Luckily, we don’t need to harvest any fruit from these vines. Ours are all volunteer plants spread most likely by the activity of birds. Growing right beside the vine in that picture is a large poplar tree. It doesn’t look too good, either. 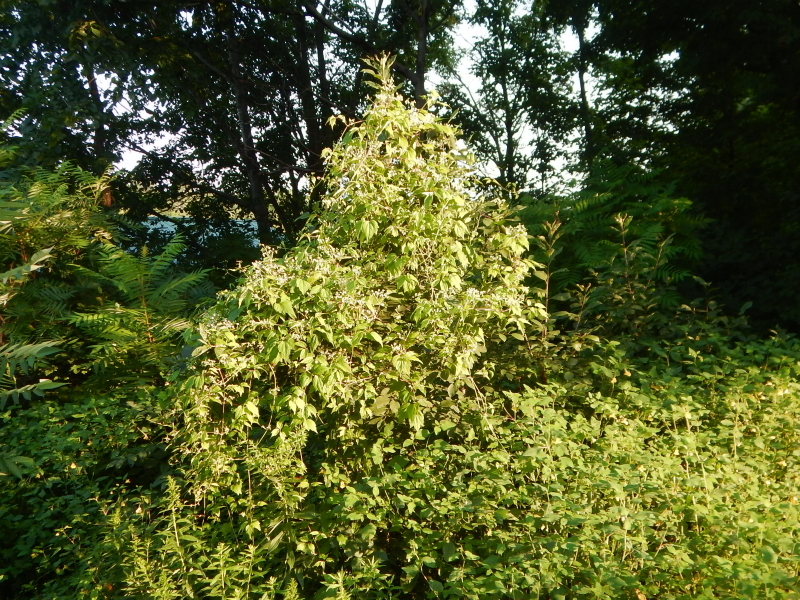 The first thing that stands out is simply the lack of healthy green color in the leaves. They all look too pale and are a little droopy, but a small portion are curling along the edges. I took a picture of a maple tree across the driveway from it for comparison. Does the difference in coloring show? Maybe not as obviously as the difference in number of leaves on each. 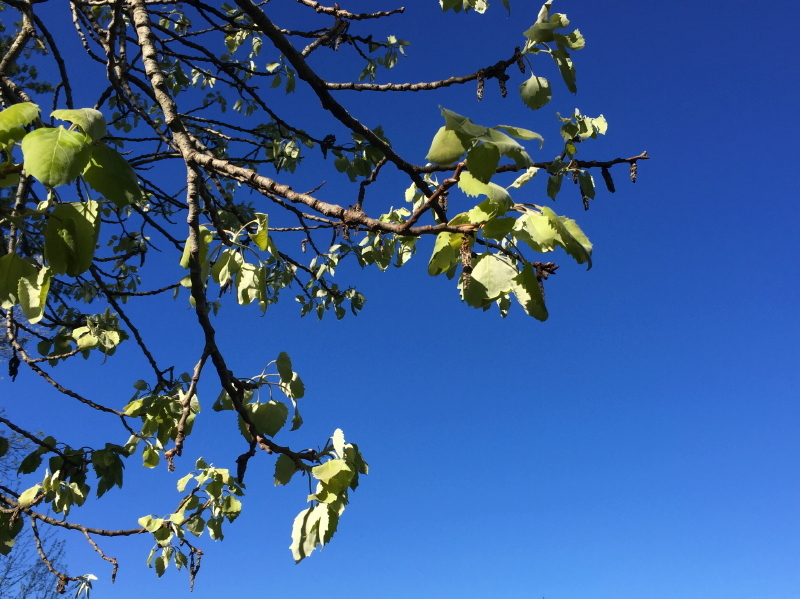 The maple is way ahead of the poplar, and maybe that contributed to it surviving the freeze so much better than the other. New growth seems particularly fragile in the presence of freezing temperatures. It’s sad to see how harsh this can be on growing plants, and frustrating to be so powerless to protect them all. It has me feeling a little wilted, right along with the leaves.